The Cape Cod Baseball League's Chatham Anglers have announced their schedule for 2019 season, the 57th year of the Cape League's modern era, the 135th overall and the 97th season for Chatham at Veterans Field. Chatham faces East Division teams (Brewster, Harwich, Orleans, Yarmouth-Dennis) six times each and West Division foes (Bourne, Cotuit, Falmouth, Hyannis, Wareham) four times each, splitting home and away evenly. All games at Chatham's Veterans Field begin at 7 p.m. with the exception of Sunday, June 23 when the Anglers face the Bourne Braves in a double header beginning at 4:30 p.m. Chatham also has a road double header June 16 at Wareham's Spillane Field at 4 p.m. With less than 150 days until the start of the season, here is a look at the key dates on the Anglers’ slate. Chatham's home opener at Veterans Field is June 12, 2019. The Anglers begin their 2019 campaign in Hyannis on a Monday night. Chatham has won six of its last eight opening night matchups, but did fall 12-4 to Wareham at home last year. Chatham's home opener is set for Wednesday night of opening week as it takes on Falmouth. The Anglers went 12-12-1 at Veterans Field in 2018. Wareham and Chatham face off in a Cape League Championship Series rematch in a Sunday doubleheader—the A’s lone trip off Cape this season. The Gatemen swept the Anglers 2-0 in last year's series. The Anglers take on Firebirds on back-to-back days to celebrate the Fourth of July. Last year, Orleans won both games of the home-and-home series 3-0. Orleans hosts the 2019 Cape Cod Baseball League All-Star Game. This year's All-Star festivities will be held at Eldredge Park and is the first time since 2004 the 106-year-old ballpark welcomes the Cape League's summer showcase. The regular season finale will be at Veterans Field this year, as the A’s battle rival Orleans one night after the two teams face each other at Eldredge Park. After an off day, the Cape League’s postseason begins on August 2. Last year, Chatham captured the East Division Championship with series victories over Harwich and Brewster. 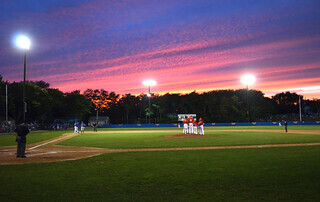 Admission to all Chatham Anglers games at Veterans Field is free of charge. Donations are welcome.